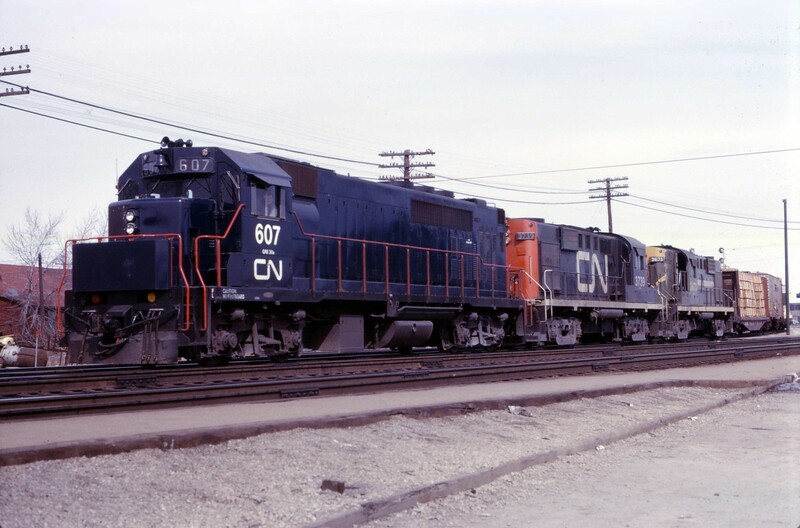 Railpictures.ca - Doug Page Photo: Prior to the launch of service in May 1967, GO Transit’s GP40TC units were used by CN in freight service around southern Ontario. Here we see “CN” 607, with RS18s 3739 and 3673 leading a westbound freight off the Halton sub onto the Oakville sub. | Railpictures.ca – Canadian Railway Photography – photographie ferroviaire Canadienne. Caption: Prior to the launch of service in May 1967, GO Transit's GP40TC units were used by CN in freight service around southern Ontario. Here we see "CN" 607, with RS18s 3739 and 3673 leading a westbound freight off the Halton sub onto the Oakville sub.